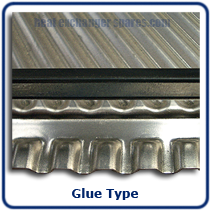 HeatExchangerSpares.com supply replacement heat exchanger gaskets for all plate heat exchangers. All plate heat exchanger gaskets are manufactured in accordance with a rigorous quality control procedure. With our gasket testing facilities, we are able to fully inspect gaskets to ensure they continuously meet our high standards. For this reason, we are able to offer a 12 month warranty (subject to conditions) on all plate heat exchanger gaskets supplied by us. Depending on the heat exchanger manufacturer and model type the heat exchanger gaskets are fixed to the heat transfer plates either mechanically or with an adhesive. The common attachments are listed below. For more detailed information select a specific manufacturer. This is the most typical adhesive method. After assembly the glue is often oven cured to ensure a good bond. However, the gaskets can normally be removed by hand leaving behind a small amount glue in the gasket groove. This process uses a hardener to complete the curing process. This forms a superior bond which stops the gasket from being easily removed from the heat transfer plate. This process is used to hold long pieces of straight gasket on larger plate heat exchangers. It would not be used to hold the entire gasket to the heat transfer plate. 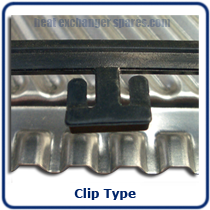 Clip type. The heat exchanger gasket is positioned on the heat transfer plate and held in place by clips, at specific areas, around the edge of the plate. 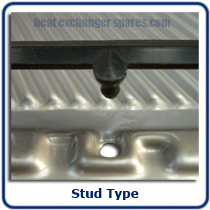 Stud type This is similar to clip type but instead of attaching to the edge of the heat transfer plate, part of the gasket (stud) is pushed through the plate, using a specific tool. 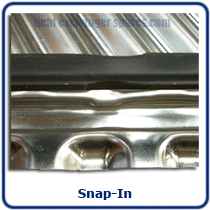 Snap-in The gasket is positioned on the heat transfer plate. At specific points the gasket groove has narrow sections, which the gasket is pushed (snapped) in to. There is a variation of this in some older gaskets where the gaskets have holes at certain points in the back of the gasket. These holes are pushed onto a 'ball' manufactured into the gasket groove thereby holding the gasket in place.